Fig. 2. In vivo 1H-NMR chemical shift selective imaging (CSSI) of western white pine seed during germination. 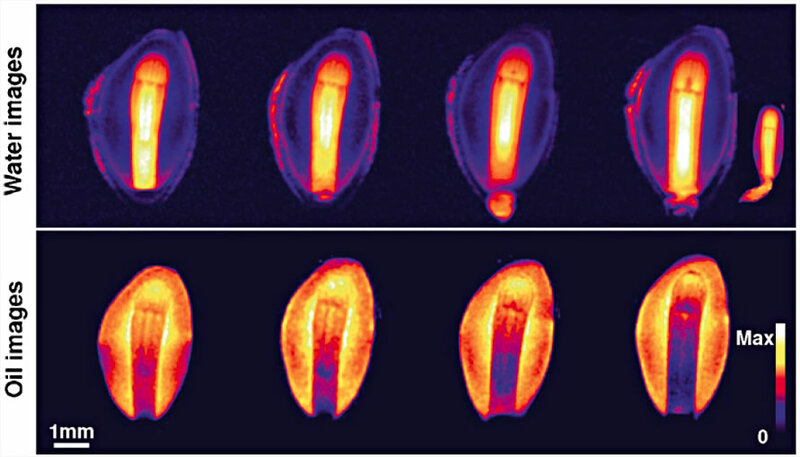 The spatial distribution of water (upper row) and oil (lower row) simultaneously mapped in the same seed over a course of early germination (left to right) is visualized with false colors as shown. Coronal plane 2D MRI images were obtained with a 78 mm in-plane resolution and a 500-mm slice thickness.